It’s very satisfying dealing with you and your staff. Your analysis of my home’s complete HVAC needs was dead-on. The extra returns and supply ducts upstairs removed the moisture problem and the area is much cooler on hot days. The new compressors really save on electricity and dramatically reduced noise. Your men did an excellent installation and finish. Their workmanship, attention to detail, adherence to schedule and overall neatness and respect for my home is first rate and appreciated. 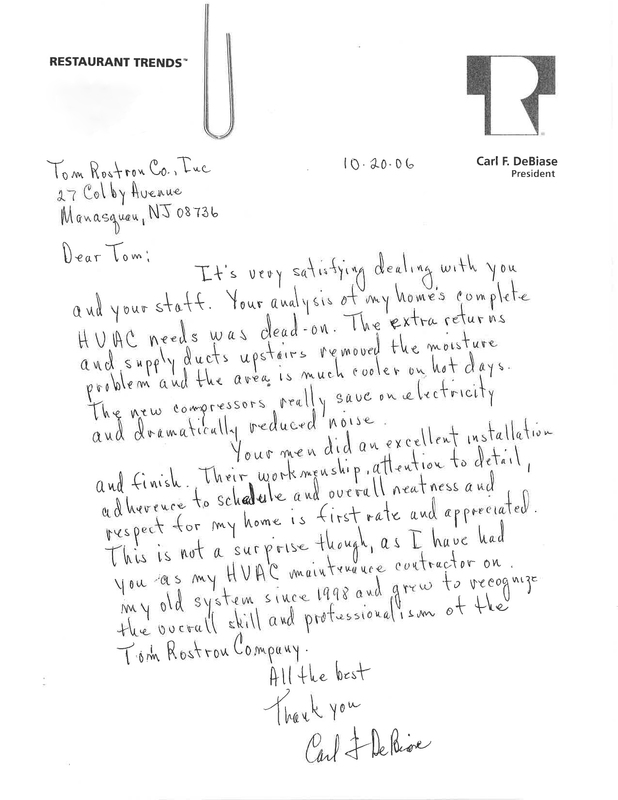 This is not a surprise though, as I have had you as my HVAC maintenance contractor on my old system since 1998 and grew to recognize the overall skill and professionalism of the Tom Rostron Company.